Readers we are please to present to you Kevin M. Weeks. He is the author of The Street Life Series: Is It Suicide Or Murder and the upcoming novel The Street Life Series: Is It Passion Or Revenge. Kevin is a talented writer who entered the literary scene with his first novel receiving overwhelming response from readers. He is the recipient of the 2007 New York Book Festival Award, 2007 MosaicBooks.com Bestseller List, Best Kept Literary Secrets of 2007, 2007 Hollywood Book Festival, Honorable Mention, and Best New Urban Author of the Year 2006. Hello Kevin, welcome to Books2Mention Magazine. I want to first take this opportunity to congratulate you on the success of your first novel. It was an incredible read that truly exposed the reality of street life. B2M: What fuels your passion for writing? KMW: Let me take a moment to thank Books2Mention Magazine for all of your support during the book launch of my debut novel. For "Is It Suicide or Murder?," a reader told me that she could envision Teco Jackson coming to life as she read the 1st chapter. Also, a book reviewer, Simon Barrett, who works in a homeless shelter in Canada stated that my debut novel's characters and scenes were so real that "Is it Suicide or Murder?" stayed on his mind for days. So, when my characters connect with the readers, this is what fuels me to write more. B2M: Where did the concept for The Street Life Series originate? KMW: In 2005, the manuscript of my debut novel was complete and I had the outline for 3 more novels in the series on the drawing board. I pitched my idea to a sponsor, who immediately liked the fresh approach to a series about the street life with positive messages of old school wisdom. Readers will continue to have a ball reading about the careers Teco chooses in each book. B2M: In your book you were able to vividly depict various situations that occur in the life of those who live life in the fast lane. Was this a difficult task to accomplish? KMW: I've seen a lot on the streets. The settings and characters depict life in the fast lane. When you have lived around and have known personal friends who have actually played out those vivid parts to their death, it's not hard to tell a story. Therefore, writing about the street life comes naturally to me. B2M: The Street Life Series: Is It Suicide Or Murder?, demonstrates just how deadly street life can be. Unfortunately, a lot of our youth today are getting caught up in this life. What suggestions would you like to offer to those who are contemplating life down this dangerous path? KMW: You know, in the publishing industry I've learned that the term "youth" is defined different ways by different organizations. Librarians define "youth or young adults" from the ages of 14 to 18, while I define "youth" between the ages of 18 to 21. 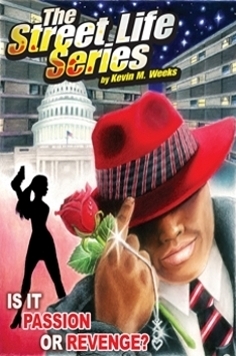 The Street Life Series® is indeed written for an adult audience (18 to 100). However, Urban Fiction is becoming more and more popular with young men and women. I want them to read my novels and ask the same question that Teco asked himself in the novel. "If you live the street life and end up dead, are you committing suicide or are you a victim of murder?" See, young people already know that life down a dangerous path leads to either death or imprisonment. However, they believe that they will never get caught. I'm willing to speak personally with at-risk youth. I believe they will have to hear words of wisdom first hand from someone with real life experiences. Also, visit my BLOG at kevinmweeks.vox.com and read my posts on "Keeping At-Risk Youth out of Prison." B2M: Can you fill readers in on what to expect with your second release The Street Life Series: Is It Passion Or Revenge? KMW: Ah man, the second book in the series is going to shock a lot of readers. Teco Jackson is now a male exotic dancer. I can't wait to get reader's reactions to the club scenes. D.C.'s #1 male exotic dancers are being murdered as Teco rises in popularity as the crowd's top performer. So, D.C.'s talented female Detective, Hanae Troop, is out to snag the delusional murderer, who kills with colorful weapons. An avid reader of both crime fiction and Urban Fiction told me that he has never read a story line like this one before. My second novel shows readers my versatility. It's true crime fiction while still keeping it urban at the same time. B2M: When exactly can we expect to see it in bookstores? B2M: Is there a possibility that one day we will be able to see The Street Life Series on the big screen? KMW: My entertainment attorney has already reviewed one offer. When we find the right match for The Street Life Series, then you will see it on the big screen. It's my job to keep producing quality work. The opportunities will continue to come. B2M: Is there a particular author that has been an influence in your writing? KMW: Noah Webster. Your readers might be saying, "Noah who?" Noah Webster is the father of the modern day dictionary. I actually read the dictionary. Words are powerful. My Editor bought me a new dictionary last year and that's all I talked about for weeks. KMW: You know, I never thought of it that way. I don't want my readers to be influenced by what I've been through or what I think is right or wrong or feel any pain I've been through because of the decisions I've made in my life. Bottom line, I enjoy writing a good story. KMW: I love being able to have a voice all over the world. As an example, I've been approached by a company who wants to translate my debut novel into Japanese. So, I remain humble. It's because of your support and the support of readers that my work reaches the masses. I'll never forget that. I wish you all the best. And thanks for this interview. Peace, Kevin. Kevin, we encourage you to continue writing novels that deliver powerful messages. We appreciate your realness and your desire to be frank with your storytelling, sparing no punches about street life and the deadly game that unfolds.